Even before I unwittingly snapped off our bow anchor platform in the French Marquesas, Wayne planned to deploy New Zealand’s excellent maritime services to replace it. Given it was as old as our 39-year-old Pearson 365 sailboat, we knew it was overdue for replacement. We just wanted it to hang in there a little bit longer. No such luck. streamline our Frankfix. It definitely helped! Meanwhile, Wayne gimped together a somewhat sturdy but rusty, pig-iron-based interim solution in conjunction with our existing, but reinforced wooden platform,. 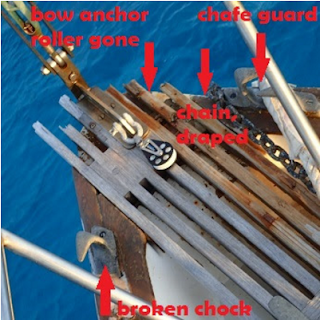 Indeed, with some adjustments, that Frankenfix bow anchor platform setup got us through ~ 5,000 miles -- all the rest of French Polynesia, a Cook Islands stop (where another fix was required), American Samoa, Tonga and, finally, into New Zealand. Deja vu, Suwarrow, Cook Islands. This time our roller was retrieved. When the time came for our New Zealand haul-out, “the guy” most recommended was heading off on vacation, unsure of when he’d get around to becoming available. While Wayne mulled over what to do about it, he was also busy with a couple other major projects, including pulling out our engine, and removingour original enclosed-below-the-cockpit fuel tank for replacement. Then, when we moved fromWhangarei’s Riverside Engine Bay to the stands on the hard, another major,totally unexpected repair sidetracked us, at a worst-case cost of $2,500-$3,000 NZD*. Since “the guy” recommended to repair our bow anchor platform was still on vacation, we asked the folks (we’ll call them “the boat builders”) who saved our bacon on our unexpected repair about also replacing our bow anchor platform. Sure, the boat builders said. *note: all $ in this post will be in NZD. To convert to US dollars, multiply by .69, roughly the exchange rate at repair time. or so at our repair destination, Whangarei New Zealand. 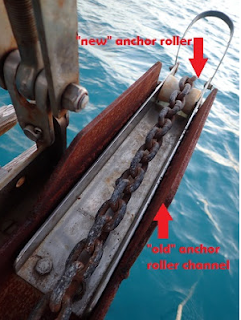 We figured there were three options on how to replace the bow anchor roller. Quality timber, which we would either finish ourselves or leave to weather. This is what our original bow anchor roller was made of. It lasted nearly 35 years. Wayne’s time, spent on more pressing engine issues was the primary reason we didn’t insist on this approach, though we considered it a viable one. Plywood, fiberglass covered. 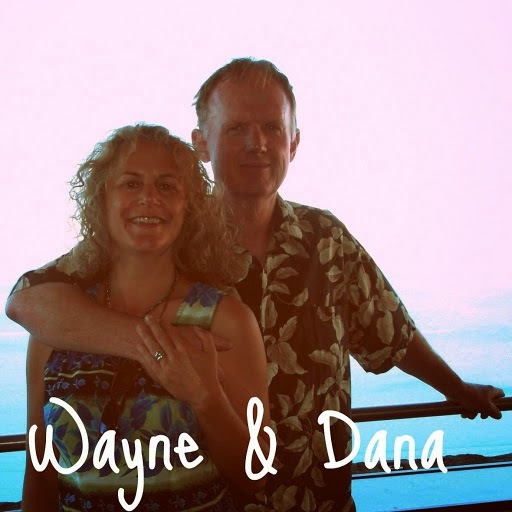 The primary appeal to this approach for us was we thought it was a solid solution, and would take less of Wayne’s time, but cost less than stainless steel. We feel it’s a higher maintenance solution than either timber or steel, but still good, and our cost sensitivity factored into our willingness to consider it. Stainless steel. Longest-lasting approach. Primary reason we didn’t insist on it was we figured it was also the costliest approach. 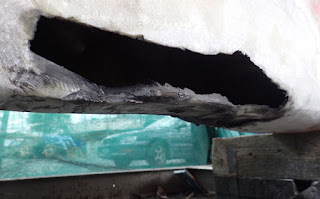 When the boat builder recommended the fiberglass approach, we assumed it was the most cost effective, viable solution, and would come in at or at least around $1,000. That’s where we made our two costliest mistakes. 1. Nothing was ever put in writing, though there was clarity around the “worst case” on our unexpected repair, $2500-$300. That project came in at slightly less then the “worst case.” We thought there was a discussion the total combined bill for both projects could come in for grand total of $3000. 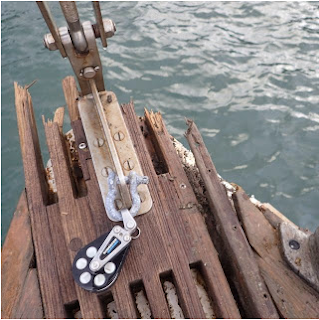 But there were no separate written cost parameters around the bow anchor platform roller alone. 2. We didn’t research up front the local costs for doing all three solutions before agreeing to what was proposed by the boat builder. We took it on faith fiberglassed plywood was the most cost effective, viable solution, and would come in at $3000 or somewhere close to that. 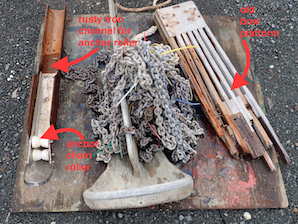 our call to the boat builder for help. The boat builders did an awesome job on our unexpected repair. They also did an awesome job on the bow anchor platform roller. 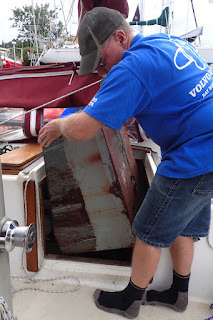 When we were applying the final bottom paint touchups on our boat’s hull, just few hours before it was to return to the water after a month in the yard, we were handed the final invoice. It came in at nearly $4.500 NZD -- $4,471.46 to be exact. We were stunned. Of that, ~$2,100 was for the bow anchor platform. again, it’s not good to sail a boat with a gaping hole in its bottom! Plus our bow anchor roller platform still needed replacement, too. We then did what we should have done in the first place – local pricing research. Option #1, a wood bow anchor roller, would cost about $1,000. It was the most recommended approach. Option #3, a stainless steel bow anchor roller, would cost about $1,700 - $1,800. Option #2, the fiberglass coated plywood, could be delivered for less, but mostly the feedback we got was it wasn’t the recommended approach. “Too flash for your older, fiberglass boat with wood trim,” was the feedback. After much protest, given we weren’t notified of the final cost until it was too late, we counter-offered $3,500. The boat builder counter-offered $4,000. and service before returning it. While we never once took issue with the quality of the boat builder’s service, we did with the invoicing expectations. Certainly, we understood it was quite possible their fully-loaded costs were justified, albeit unexpectedly high. When the time came to go to pay, I gritted my teeth, prepared for further negotiation. I admitted our mistake was not getting a bid in writing and fully researching our options up front, but theirs was in not keeping us informed of the costs in a timely manner. The boat builder admitted at the time of our project, they were not monitoring their hours as closely, and now were, even added staff to do so. Ultimately, the boat builder cared more about my leaving as a happy customer, and agreed to accept $3,500. I told him I felt that was fair, and believed he probably didn’t, but that I appreciated his doing the right thing from my perspective, as he met me more than halfway. Did the boat builder make as he claimed “No profit”? Debatable. Regardless, we both learned some hard lessons. Bottom line? If we had it to do over again, given what we know now, we’d have gone with either stainless steel (best), or (cheapest, yet still good and most appropriate for our boat’s style and vintage) a wood bow anchor roller. Will what we still provide a strong, viable solution? Yes. Old bow Frankenfix bow anchor roller channel on left. 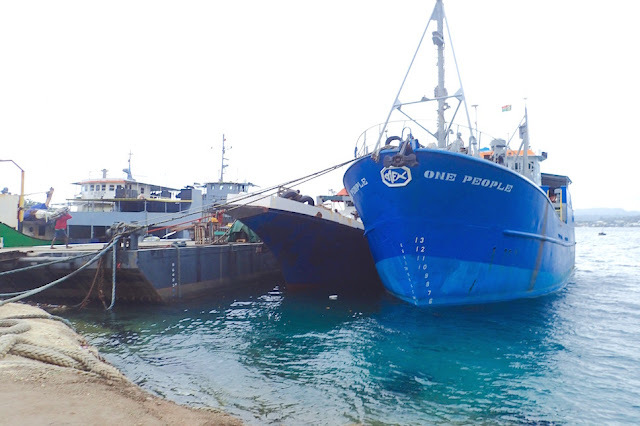 Boat owners request an agreement around cost parameters in writing up front. Boat owners monitor the progress, verifying that it’s within parameters or the work stops until there’s mutual agreement on how best to proceed if the cost are exceeding the parameters. 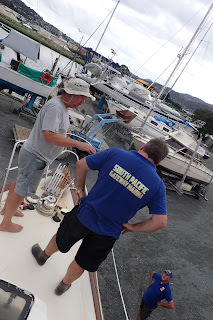 If there’s more than one solution, ideally, boat owners take responsibility for seeking quotes, from more than one service provide if appropriate, to evaluate the best solution prior to beginning work. 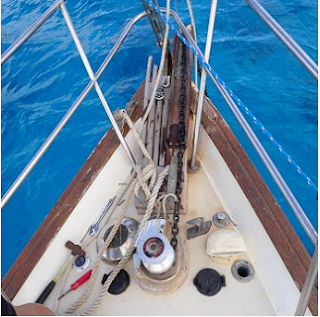 In sailing, when it comes to reefing, if you think you need to do it, you need to do it. 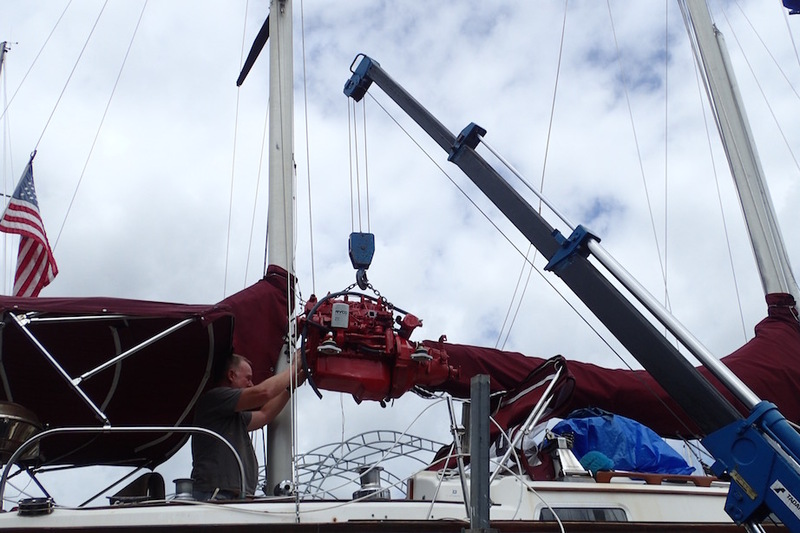 When it comes to best practices in commissioning boat work, if you think you need to do up front and progressive due diligence, you need to do up front and progressive due diligence. Unlike reefing, even if you don’t think you need to do up front and progressive due diligence, you need to do it anyway. 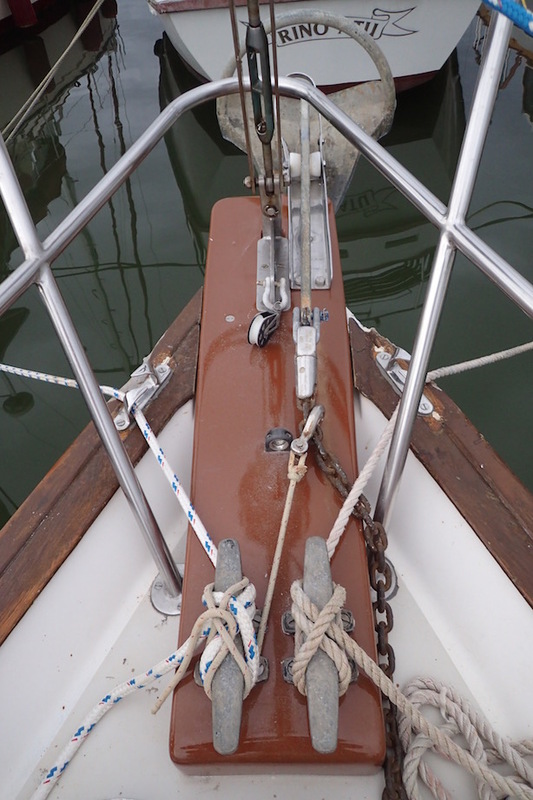 New fiberglass on wood bow anchor platform. chain chipping the new fiberglass platform. Meanwhile, I am grateful. In the end, I felt given the circumstances, our boat builder behaved honorably, even though he no doubt felt it hurt him financially as much or more as it hurt us. We try to remember we're all in this together. Boat builders need earn enough to sustainably offer good, quality work. Cruisers need to find ways to sail safely within our means and share our experiences and best practice advice with other cruisers to support the best and when appropriate, weed out the rest. Sadly, there’s a reason the term “boat bucks” (1 boat buck = $1,000 expense) came into being. May your boat bucks be well spent, for your maximum sailing safety and pleasure. Fixed and ready to splash in Whangarei. previously an overly deep bilge. 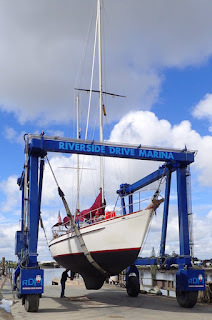 We're back on a pole mooring in Whangarei’s Town Basin Marina (S35.43.412 E174.19.539). 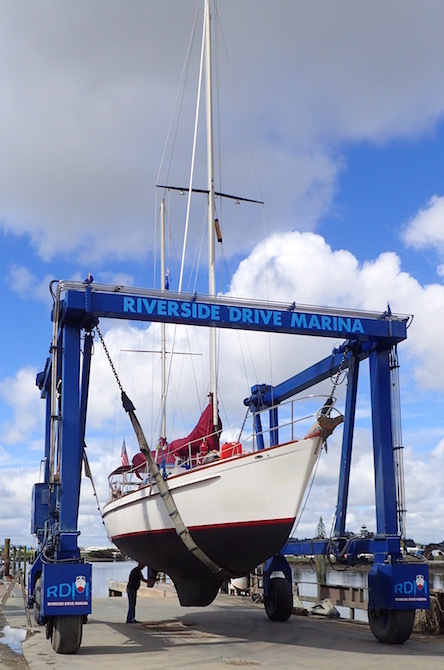 Likely we'll leave Whangarei as early as April 27, 2016, with a test run to Opua, then checkout. Last year, between December 2014 and November 2015 we sailed from Florida USA to New Zealand, over 10,000 miles. Current plan's to resume cruising this May. First stop's Fiji, ~1170 nm. We plan to sell our boat in Australia. We've done our best to make sure our boat's in excellent shape for her next owner. The platform on my 365 has rotten and needs to be fixed. I like your Frankenfix! Did you have enough good wood in the remaining sections to bolt to, or did you have to add more?